The 2014 World Cup ends Sunday with a final between Germany and Argentina, respectively the third- and fourth-most successful teams in the tournament’s history. If Die Mannschaft wins, Germany would tie Italy for second place all-time with four World Cup victories, behind Brazil and Italy; meanwhile, Argentina is hoping to grab its third title and tie the Germans in championships. Either way, we’re in for a deserving final between what are probably the two best national teams in the world. The story lines abound, from Germany’s scary-good young core to the impossible brilliance that is Argentina’s Lionel Messi. Let’s start breaking it down. 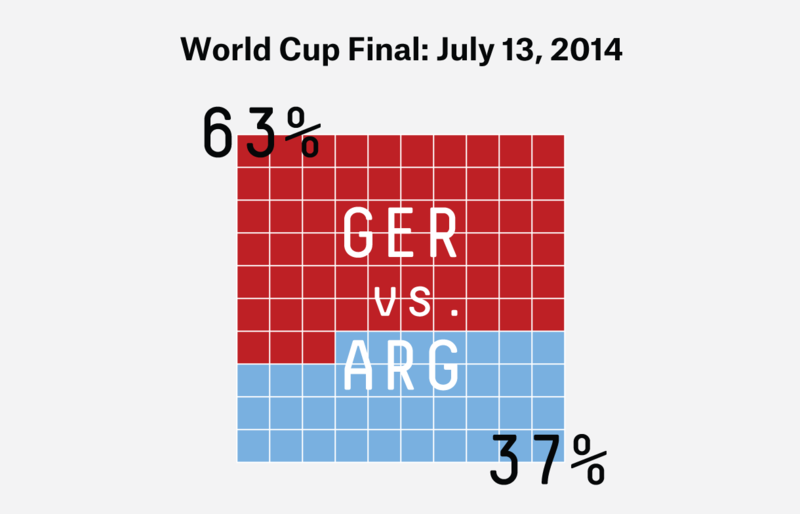 See our World Cup predictions for the latest probabilities. If ever you believed in momentum, this German team seems to have it after punching its ticket to the final with a colossal 7-1 blowout of Brazil, probably the most shocking result in the history of the World Cup. Riding that wave, Germany catapulted to the top spot in ESPN’s Soccer Power Index (SPI), deposing the World Cup host and knocking it down to fourth place in one fell swoop. At any rate, the Germans are favored in large part because of their offense, and you don’t have to be shell-shocked Brazilian goalkeeper Julio César to realize that Germany is a scoring powerhouse. It easily ranks first in the offensive component of the SPI ratings, at nearly two-fifths of a goal per game better than any other team in the world. Germany has adopted many of the “sabermetric” philosophies we highlighted before the tournament. Its players relentlessly maintain possession of the ball, eschewing crosses from the wing in favor of attacks through the middle of the pitch. They make endless short passes rather than dribbling the ball into traffic. They wait for high-percentage chances to open up inside the box, rather than firing shots from the outside. Although they haven’t completely cut the long ball out of their repertoire, most of what the Germans do on offense meshes perfectly with what correlates best with goal-scoring. Of course, it helps to have a huge amount of offensive skill on your roster, as Germany does. Any team in the world would love to have the likes of Thomas Muller, Mesut Ozil, Toni Kroos and Bastian Schweinsteiger in their starting 11, with Mario Gotze, Miroslav Klose and Andre Schurrle coming off the bench. But by the estimation of SPI’s individual player ratings, Germany only has the third-most talented set of offensive players among national teams. It’s not implausible to suggest that the gap between its actual offensive SPI (3.4) and what we’d predict from its component players (2.8) is driven by how those parts have been used. And to manager Joachim Loew’s credit, that extra 0.6 goals per game more than expected is the most of any team in this World Cup. Any concern about Germany may be the same as the concern going into the tournament: defense. But relative to the offensive SPI ratings of their opponents, Germany has allowed 0.49 fewer goals per game than the average World Cup team, which is the third-best defensive showing of any team in the field thus far. Although Argentina is still probably the better team defensively, Germany has done a lot over the past month to quell any pre-tournament worries that its ability to prevent goals was far behind its ability to create them. In this year’s World Cup, Argentina hasn’t trailed for a single second of a single game. Both its defense and goalkeeping has been stellar, having only allowed three goals, one of which was in garbage time against Bosnia-Herzegovina, and the other two coming against Nigeria in a game played after Argentina had clinched its group. In other words, Argentina has yet to concede a goal in meaningful play. Plus, it has this guy named Lionel Messi (who is pretty good), arguably playing the best he ever has for Argentina. Yet the Argentines head into the final as underdogs — not surprising given Germany’s form and the history between these two teams. Since Messi’s national team debut in 2006, Argentina is undefeated (13-0-1) in World Cup matches against teams not named Germany. In 2006, Germany eliminated Argentina in the quarterfinals in a penalty shootout (with Messi on the bench). The only match Argentina has lost with Messi playing was the 2010 quarterfinals against Germany. The last time Argentina beat Germany was the last time it won the World Cup, in 1986. But that’s history. The more present concern is that Germany just put the smack down on what was the No. 1 ranked team in the world, has an offense that scored as many goals last game as Argentina’s has this whole tournament, and been almost as good at keeping the ball out of the net — conceding only four goals (to Argentina’s three). Oh, and Germany has played a tougher schedule, and it has only trailed for eight minutes (against Ghana, before equalizing for the tie). Against the Argentine defense, opponents have only gotten off 9.5 shots and 2.5 shots on goal per 90 minutes, ranking fourth and third, respectively, among all teams in the tournament. On top of that, Argentina has a great goalkeeper, Sergio Romero. He has four clean sheets in six games. His 1.01 goals against below average (GABA) — a TruMedia metric for how many goals a keeper prevents relative to the expectation of the shots opponents took — is the sixth best of the tournament, comparing favorably to the likes of “Secretary of Defense” Tim Howard and Germany’s much-celebrated Manuel Neuer. The Argentina defense also does a good job making plays that create possessions for its offense. If we add up a defense’s tackles, clearances, interceptions, offsides drawn, aerials won, etc. (weighting interceptions and offsides a little higher), we can estimate the number of possessions gained per minute by defensive playmaking. Argentina’s defense is well above average, gaining about 3.5 more possessions per 90 minutes than Germany’s. Similarly, we can add up all the shots, missed passes, offside calls, turnovers and dispossessions that a team makes relative to its opponents to find out how many possessions it takes per 90 minutes relative to its opponents (note that, unlike basketball, possessions in soccer aren’t symmetrical, because many “end” with loose/cleared balls that may be recovered by either team). From this, we find that Argentina typically earns itself about 7.25 more possessions per game than its opponents, while Germany earns 1.05 more, giving Argentina about a six-possession advantage. (So Argentina’s defense may be doing a bit better than we would estimate, and/or the whole team is generally good at winning possessions). How much is that worth? Some but not a lot: The typical number of possessions per side per 90 minutes is about 120, so that gains Argentina about 5 percent more opportunities. Based on his YouTube highlights, expect Messi to dribble through the entire German team and score a goal every time he gets the ball. Messi has four goals (plus a made shootout attempt in the Netherlands game), second-best of the tournament, plus the dramatic game-winning assist to Angel di Maria against Switzerland. Messi’s success at taking on defenders (59.1 percent), his passing/chance creation (leads all players), and his defense (making nearly twice as many defensive plays as he normally does in club play) have all been stellar, even by his standards. So, what is Argentina up against? Its offense stinks. Messi is incredible; everyone else is terrible. Further, Messi has been playing more of a center-attacking midfielder role than usual, which has led to chance creation but cut down on his shots and his number of possessions inside the box. This has resulted in some stellar long-range shooting from Messi, but his teammates are taking the theoretically “easier” shots and missing them. If we use ESPN/TruMedia’s Expected Goals model to assess how well Messi and his team are doing on their shots, we find that Messi has earned 2.5 goals above expectation (on only 19 shots), while the rest of his team has cost 3.5 goals relative to what it should have scored on its 79 shots (21 of which were created by Messi). The third-place World Cup match seemed to be a continuation of the semifinal for Brazil, as the home team fell 3-0 to the Dutch. Prior to its 7-1 semifinal drubbing against Germany, Brazil had lost by three goals just once in its first 102 World Cup matches (the 1998 final against France). It then happened in back-to-back matches. Overall, Brazil conceded 14 goals in this tournament, its most in a single World Cup, and the most by any team in a World Cup since Belgium conceded 15 in 1986. Robin van Persie opened the scoring Saturday with a third-minute penalty. Brazil conceded again in the 17th minute, as Daley Blind scored. Brazil conceded 10 goals in its past two matches, its most ever in consecutive World Cup matches. By comparison, Brazil conceded 10 goals in the 2002, 2006 and 2010 World Cups combined.